Today’s Greenlight spotlight shines on APT, a first-person puzzle game by R.I.P Studios. Initial thoughts immediately liken the game to the Portal series, and these thoughts are very correct. However, this is not necessarily a negative thing. 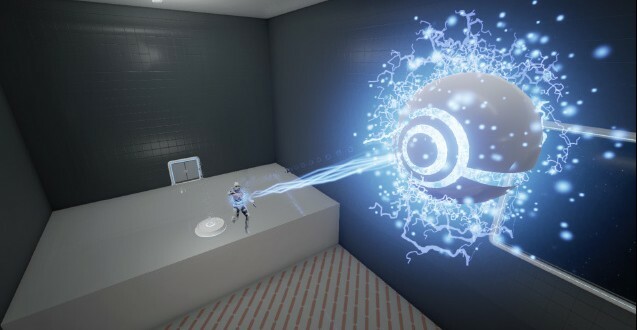 Portal is one of the most inventive, challenging, and entertaining games on the market, which means that there is plenty of room for other developers to make similar games, as long as they are just as enjoyable and difficult. APT seems to be heading in the right direction when it comes to holding its own against other first-person puzzlers. Made in the powerful Unreal Engine 4, the game exhibits some solid visuals, although they are a bit bleak for my tastes. Hopefully R.I.P Studios will spend some time tuning the visuals as the development progresses, as APT is only in the very early alpha stages at this time. One of the things that APT does right is the simple control setup. Typical WASD movement controls paired with a left click and a right click ability make the game very easy to pick up and play. This is not to say that the game is easy by any stretch of the imagination, however. The combination of simple controls, yet deviously difficult puzzles makes APT a very strong contender in the first-person puzzle genre. APT allows color customization, which is always nice. 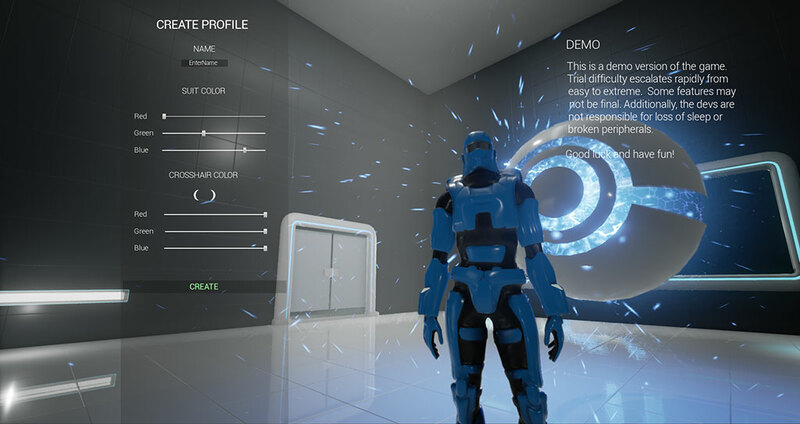 Upon booting up the demo, I was greeted with a nice character customization screen, which allows you to change the color of your player using RGB sliders, as well as the color of your crosshair. This is extremely nice for not only aesthetic purposes, but for accessibility as well. Another great feature is the addition of an FOV option, ranging from 85 to 105. This is very important in a game such as APT because the quick turns and movements required to complete many of the puzzles can easily cause motion sickness at lower FOVs. The real draw of APT, however, is the difficult and entertaining challenges that the levels provide. The demo, which you can download from their Greenlight page, features 7 levels ranging in difficulty from very easy to very hard. After playing the demo for nearly an hour, I had still not been able to beat the two hardest levels(which may be a testament to my lack of skill in the genre). The controls feel very solid, and I never felt like a failure on a level was anything other than my own doing. You have a left click which you can use to activate various switches in the levels, and a right click tether ability which is showcased in the above video when I tether to the ball and use it to boost myself up to the platform. You can also do a double jump if you press the space bar a second time after jumping initially. These abilities all have short cooldowns, so if you miss a tether or jump too soon, you will not be able to easily correct yourself. Also, the cooldowns are nicely displayed on your wrist HUD as you can see in the video as well. The body part that you use will turn red when it is on cooldown, and green when it is available again. APT does a fantastic job of providing a challenge in the levels that the demo showcases. We can only hope that R.I.P Studios will continue to raise the bar with their future content updates. At first glance, APT may seem like a Portal rip off. However, do yourself a favor and play the demo before you write it off as such. 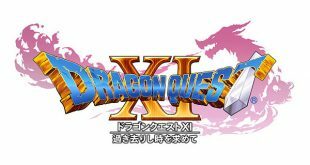 Good games should be rewarded with publicity and positive feedback from the community, and it would be a shame to see the game fail because of a moderate similarity to an existing game. If you’re interesting in checking it out, you can find their Greenlight page here. While you are there, make sure to download the demo located on the page, and also consider leaving a vote or some constructive feedback on some things that you would like to see in the game. APT is looking very good from what we’ve seen, and I’m very interested to follow the development of the game as it progresses. Previous Meowl Games Announces Kickstarter Campaign For CHANGE!